Typnic is an handmade typeface created by Manuel Eduardo Corradine and published by Corradine Fonts that is available in 18 fonts, 3 different compatible styles (Compact, Swash, Complements), including labels, ornaments, patters, dingbats sets. Each styles has some characteristics. The Headline styles contains 6 layered fonts (Regular, Highlight, Highlighted, Inline, Shadow, Fill) that you can combine and can create beautiful things. Typnic Script has 6 variants ideal for informal texts and Typnic Roman can be use to add secondary text. Exploits & enjoy Typnic! 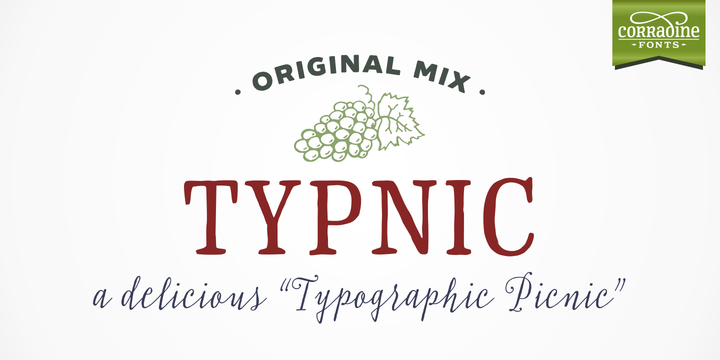 Note: Typnic is a trademark of Corradine Fonts. A font description published on Friday, June 26th, 2015 in Corradine Fonts, Fonts, Manuel Eduardo Corradine by Alexandra that has 4,616 views.